I have tried to make several different homemade veggie burgers and this Basil Chickpea Burger is the absolute best! Most veggie burgers that I have tried either crumble when you bite into them or are super dry and have no flavor. The garbanzo beans and tahini provide the ‘meaty’ texture in this burger which is very similar to a traditional burger. 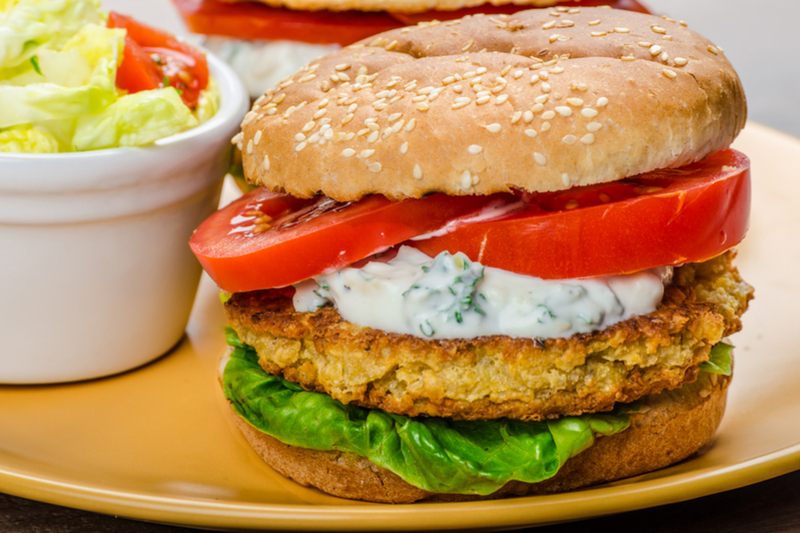 Moist and delicious basil chickpea burger. The basil and sun-dried tomatoes provides the burger with a depth of flavor that lacks in most veggie and meat burgers. Make sure to drain your chickpeas and mix your tahini well. Otherwise your burgers might end up too moist. Once you have all the ingredients in the food processor, mix well to incorporate all of the flavors. The mixture should resemble a thick paste. Refrigerate for at least an hour before making your patties. 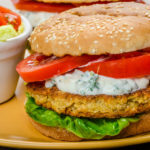 You can make these chickpea burgers ahead of time and flash freeze them by placing them on a baking sheet lined with wax paper. Once firm, store in a freezer safe container for up to one month. Once you are ready to cook the burgers allow them to thaw and cook as instructed. 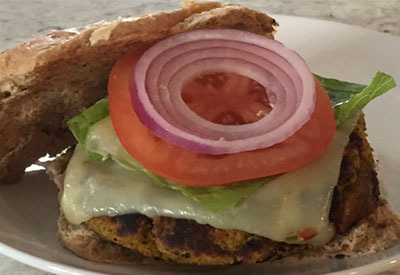 Check out our favorite Veggie Burger For Grilling recipe. This veggie burger has the texture and consistency of a meat burger with a light and refreshing flavor. Add basil, onion, garlic, and sun-dried tomatoes to a food processor. Mix until well combined. Add 2 ½ cups of drained chickpeas, cumin, turmeric, salt, pepper, cayenne and tahini to the food processor mixture. Mix to combine, scraping down the sides as needed. Add the rest of the chickpeas and blend until the mixture resembles a thick paste consistency. Add additional tahini if the mixture is too dry. Cover and place in the refrigerator for an hour for the mixture to firm up. Remove from refrigerator and form patties. Heat a large skillet over medium heat. Add olive oil to create a thin layer on the bottom of the pan. Once olive oil is hot add burgers to the skillet. Cook 2-3 minutes on each side, being careful when flipping.